And wouldn’t you agree wearing it once at a wedding is a waste? So, why don’t we re-wear it this holiday season! My headband is by Maggie Wu Studio, a handmade piece that easily “upgrades” your hair style. 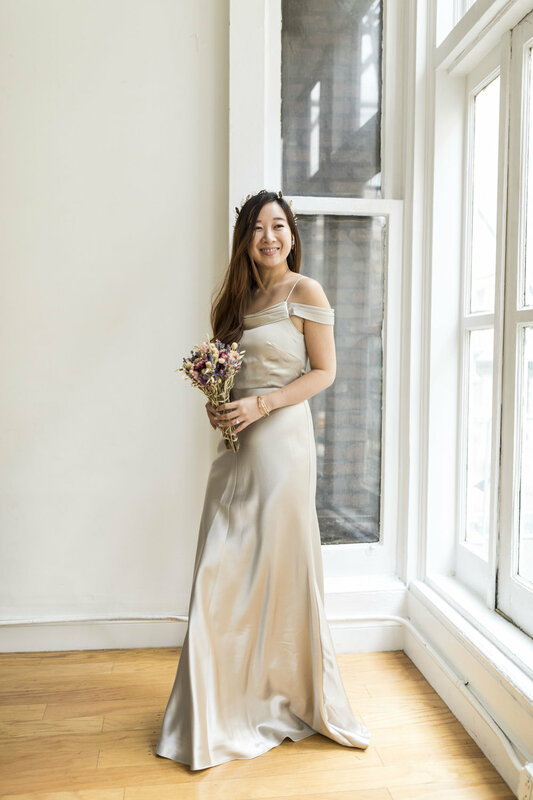 This Jenny Yoo satin gown features a fluid A-line design. Photos by Ashley Gallerani. Let’s say you got a formal work event you need to attend and don’t have a suitable dress (or gown) for it. Make use of what you have and simply add a blazer over it! Belt the blazer with a wide obi belt that cinches your waist and elongates your lower half. I have blazers in various colors, but in order to keep the overall tones neutral, which is a bit more business-appropriate in my opinion, I went for a light grey one. 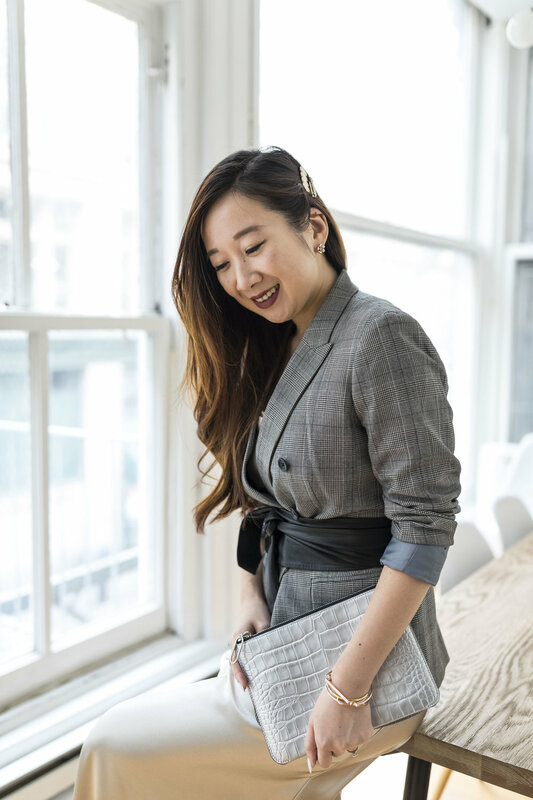 Keep the overall color tones neutral with a grey blazer and silver pouch. The silver pouch is from Jeff Wan; you can use HAPPILYEVERSTYLE15 to get 15% off. The best time to re-wear fancy dresses is year-end! 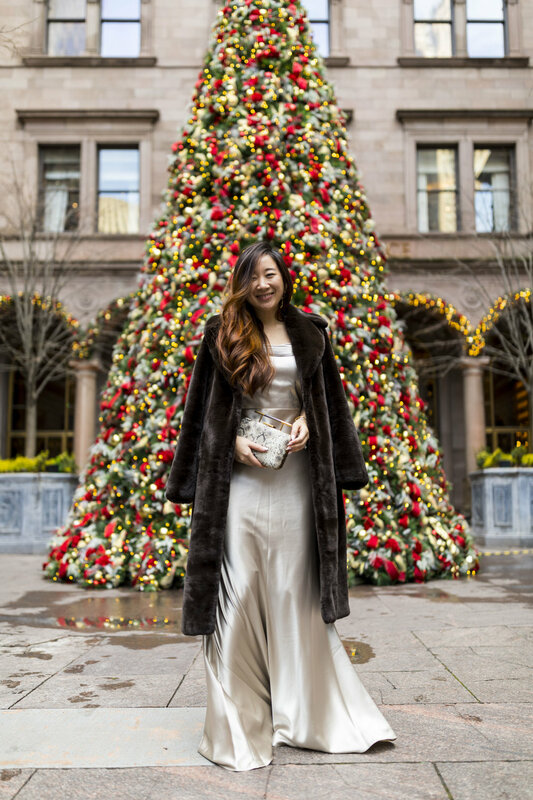 Whether it is a Christmas party or New Year’s Eve celebration, you can’t go wrong with a touch a elegant glam. And because it is cold, I’m throwing on a faux fur coat to keep myself warm, but still party-ready. Which look do you like more? Let me know by leaving a comment below! Go on a mini self-discovery journey on finding your true beauty with me.